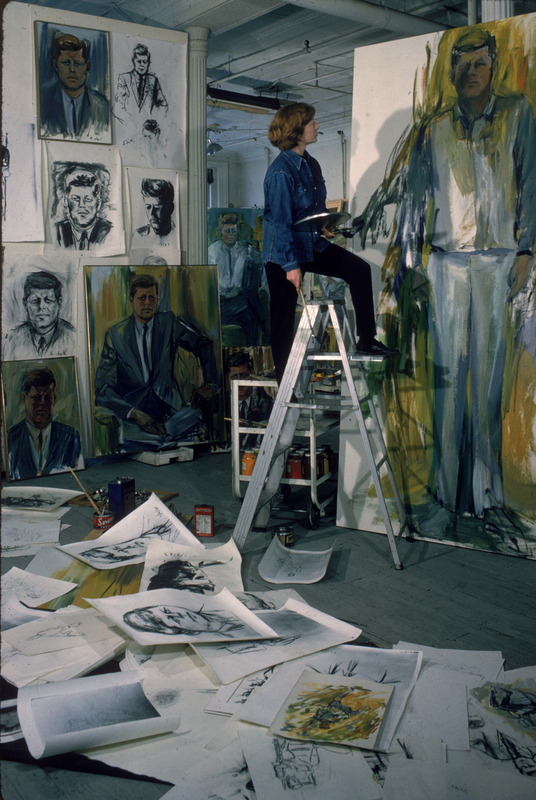 Elaine de Kooning (1918 – 1989) (born Elaine Marie Fried) works on a series of portraits of President John F. Kennedy in her studio, New York, New York, 1964. Photo by Alfred Eisenstaedt. I am absolutely dying to visit The National Portrait Gallery’s current exhibition, Elaine de Kooning: Portraits, curated by Brandon Brame Fortune, the Portrait Gallery’s chief curator and senior curator of painting and sculpture. I have had an obsession with the portraits of Elaine de Kooning, specifically her male portraits, since graduate school. The expressive and immense figures of men, which emerge from the canvases of artist Elaine de Kooning, are a stunning snapshot of the male figures, famous and unknown, of the New York art scene of the early to mid-twentieth century. Elaine de Kooning was a dynamic force in the New York School, known for her beauty, artistic talent, and confident nature. She quickly formed connections throughout the abstract expressionist circle, including with artist Willem (Bill) de Kooning, Elaine’s future teacher, husband and friend. Though a prominent figure within the New York artists’ circle, as well as a prolific writer, art critic and artist herself, Elaine was often overshadowed by her husband Bill, as well as the other male abstract expressionist who dominated the art world. Though Elaine explored numerous themes within her paintings, portraits of the male figure seemed to persist throughout her career, abetted by her access to numerous male figures in the New York art circle. Elaine de Kooning was one of the few abstract expressionists, as well as one of the only women, who explored the subject of male portraiture during the mid-twentieth century. Yet, rather than allow portraiture to limit her artistic direction, ‘E de K’ used her subjects to reveal the inner characters of the important male figures of post-World War II America, and expand the subject matter of Abstract Expressionism.